To celebrate the 15-year anniversary of Starcraft, Blizzard are offering StarCraft II: Wings of Liberty players a brand-new Feat of Strength achievement and three portrait rewards. 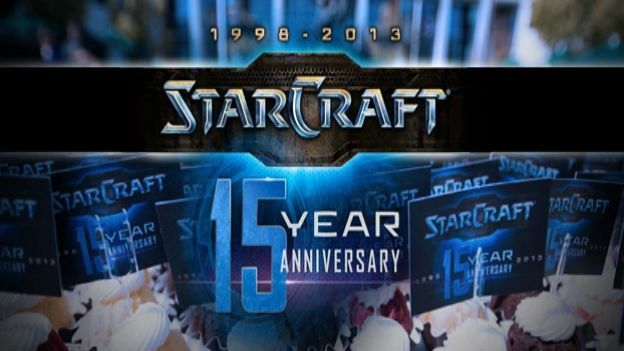 StarCraft was released back in 1998, followed by StarCraft 2 in 2010. To mark the 15th anniversary of the game, Blizzard have invited users to join the festivities with a new achievement and rewards. The three portrait rewards available feature the original Terran, Protoss, and Zerg StarCraft box art. In the official blog, battle.net say, "We feel these portraits pay homage to StaCraft's remarkable history, and are a great way for everyone to take part in the 15-year anniversary." Users hoping to receive the achievement/rewards will need to take part in a mission. The only objective; play one game of StarCraft 2 in any online mode before 11:59 PDT on April 17. Starting today, players must chose an Arcade, Custom, Ranked, Training, Unranked of Versus A.I. game to earn the 'Feat of Strength' achievement. Once releasing the achivement, all three portraits will unlock for your character profile. Players must note that, "Campaign, Offline Customer Games, replys, and observing friends' games don't count toward reward progress." Blizzard's first expansion StarCraft II: Heart of the Swarm was launched earlier this month. For the full blog post and desktop wallpaper featuring Terran Marine, Zerg Hydralisk, and Protoss Zealot click here.